1. I went to go type something into my computer last week, and nothing happened. I tried unplugging the keyboard from the USB port and putting it into a different port, but nothing happened. Then I noted that there were no lights on the keyboard either - after nearly 10 years, it had died! Luckily, I had a brand new keyboard sitting around waiting to take its place, because I knew this day was coming sooner or later! My new keyboard feels so funny. Yea, I know it's cleaner than the old one (note to self- start washing your hands every time before sitting down to type!) 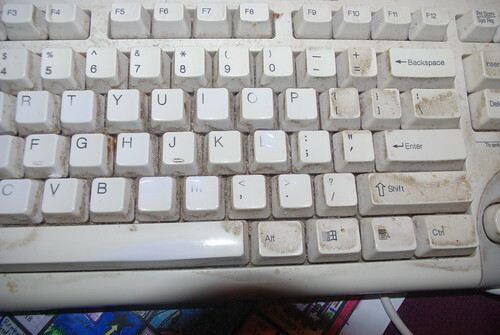 but also I had worn away certain letters of the old keyboard - note that N and M are almost totally gone!! Good bye old friend- Izzy has some use for you in a craft she is planning, but I shall miss you as I get use to this new keyboard. 2. 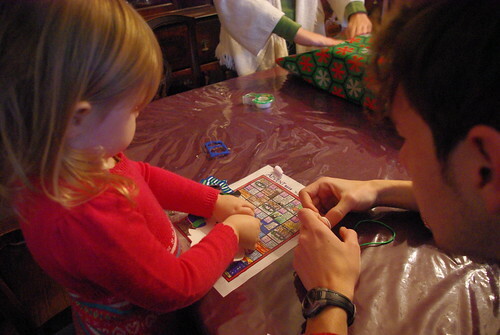 My granddaughter is becoming a crafter. I can't keep up with her crafting needs! I bought some ornaments for her to make from the Oriental Trading Company. 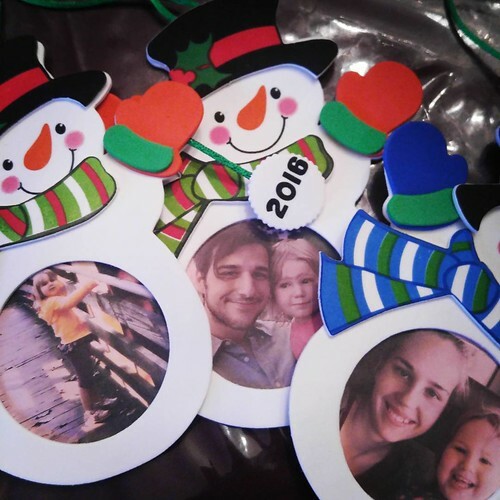 I figured that 12 ornaments would be enough to keep her going until Christmas - instead, she finished them all last week! 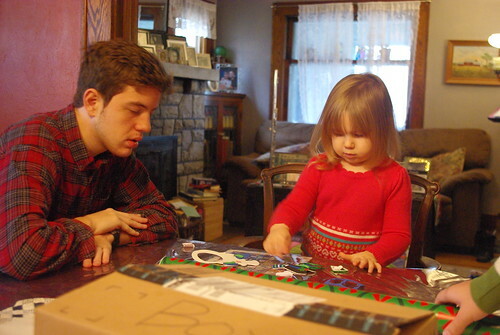 Here she shows her Uncle Noah how to work with these foam ornaments! She did such a nice job I used them as part of the CSAdvent challenge on Instagram! 3. I have played two of my many concerts this week. I think they went fairly well. 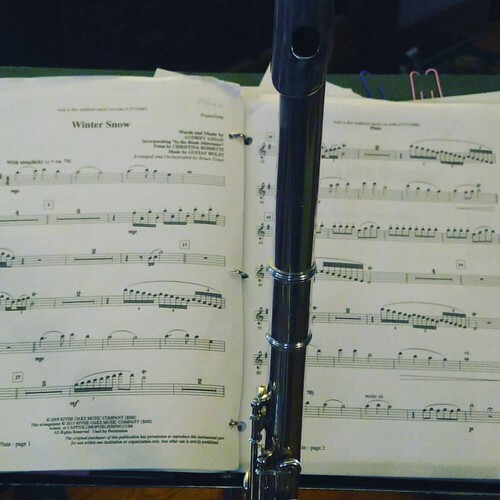 The piece pictured below has been challening because of its many runs and technical issues, but I have been able to memorize most of it and that makes me feel much calmer when I perform them. Two more performances next week, then on to Midnight Mass - and then nothing for a while. 4. Noah did his very first Christmas Concert for his college on Friday night - it was wonderful. Here's a clip of my runner doing actual choreography!! Next week is his last week before winter break. He has three exams to do and then he will be done. So far he's pulling all As and tells me that his first semester of college was easier than his last year of homeschooling. I think that's because as a homeschool mom, I was a little terrified of leaving something out. I'm happy that he was prepared enough to be able to handle his course work and have some fun too! 5. My nephew moved to Chicago this week. Three years ago my personal vocation of motherhood was a little dented and bruised. My older children weren't living up to the Catholic values we had tried to instill in them. One had moved out, a second was moving in with his girlfriend over our objections, and a third had to leave without finishing high school. The empty places around our dining room table were stark reminders to me that I had failed as a mother to form, protect and pass the faith on to my own children. Yet at that very same time, two of my godchildren needed a place to hang out regularly, and a family to envelop them. They came every night and most weekends and in a way, taking care of them helped me to heal and took some of the ache out of my heart. 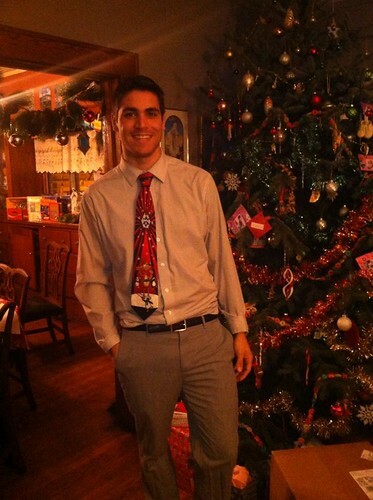 Now it's time for my godson to spread his wings and try out the new job he is so enthusiastic about. I'm proud of hm and excited to see where this journey takes him, yet grateful for the time we had together. By helping him, he was helping me. 6. One of my greatest pleasures in life is watching t.v. with my daughters. There was a time, after the birth of my fourth son in 9 years, that I didn't think I would ever have a daughter. And now I have two. This winter we are binge watching old episodes of I Love Lucy on Amazon - and they are thoroughly enjoying it! Truth be told- I'm getting a kick out of it too! I remember the comedy of Lucy, but I didn't remember how fashionable she was! These old clothes from the 50s are awesome! 7. I've blogged a few times about my battle with onychomycosis - toenail fungus. After dealing with ugly, yellow, thick and painful toenails for a few years, I finally decided to do something about it. Last year I went to a podiatrist and had the nails lasered four different times. That seemed to help the infection, but it didn't totally clear it up. My podiatrist then prescribed Jublia, a topical solution to apply to the nails to help finish clearing the infection. Jublia is expensive. It retails between $400 to $1000 or more for a tiny little bottle. I have been able to get coupons and discounts for my prescription and the most I have ever had to pay was $40. But the manufacturers also have a limited on the prescription to 12 refills. I have just used my last refill and still I had a few nails that just didn't look completely clear. I am also afraid of ever having my nails become re-infected. Then by chance, I saw this podiatrist's video about different cures on Youtube and he cited a study on Vicks Vapo Rub as having a 28% cure rate for onychomycosis. That's even better than Jubilia. So I tried it and it seems to be clearing up the last little stubborn bits that I had. Mr. Pete started using it too and even he is having some good results - who knew that a little $8 bottle of something we could get at the drug store over the counter, would be as effective as these expensive cures! Still, I think that my infection was severe enough that the laser really helped it and I'm glad I had the opportunity to try Jublia and restore my nails back to about 90% normal. If this cheap cure can take me to 100%, that would be great!